There has certainly been a change in temperature in the last few weeks. It’s time to grab the hat, scarf and gloves. The busy period of December awaits with seven Premier League games to come and a schedule that can be pivotal for many clubs. Of course for many squad members it hasn’t been an international ‘break’. Plenty of players have clocked up the air miles to make appearances for their country and now return to domestic action. The highlight of the last few weeks for anyone involved with the Albion will have been Lewis Dunk’s England debut but several others have been trying to impress at international level. Maty Ryan, Shane Duffy, Gaetan Bong and Beram Kayal were all involved. It will have been refreshing for manager Chris Hughton to see the Israeli Kayal scoring such a wonderful goal against Scotland. The Nations League seems to have re-invigorated the international scene for many countries in Europe and can now be added to a host of other worldwide competitions. Ryan will be missing in January for the Asian Cup and Leon Balogun is expected to be involved in the Africa Cup of Nations next year. 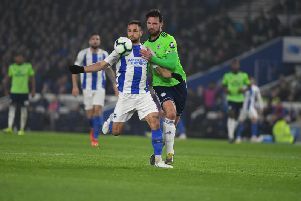 More and more a club the size of Brighton and Hove Albion will need to strike a balance between home grown talent, signings from abroad and internationals who may be missing for part of the season. Football, and the world for that matter, seems to be in a constant state of change and flux at the moment. Brexit has thrown up a huge amount of debate and analysis but could also prompt fundamental changes. The Football Association hopes to use negotiations to improve the chances for homegrown players in Premier League squads. Currently clubs are allowed up to 17 non-homegrown players in the 25-man squads but the FA wants 13. The proposal may be met with concerns from some top-flight clubs but at the same time England manager Gareth Southgate wants more English players in the Premier League (currently around 30 per cent). When businesses are planning for the future or assessing their risk management, they must study, analyse and anticipate legislative reform. Premier League clubs are no different. The impact of the referendum will be discussed across Europe, in cabinet meetings, and by many of us in cafes and pubs but it will also be a hot topic around the polished boardroom tables in football clubs across the country. Recruitment may be adapted at the club and FA supremo Dan Ashworth, who arrives in spring next year, may be able to use his extensive contacts to entice young homegrown talent to the south coast. His appointment could well be a masterstroke. Albion may yet have more England internationals in the future and any possible requirements or changes will be ongoing right now. Finally, thank-you to Seagulls’ captain Bruno who will be attending the BBC Sussex Community Heroes awards night next Monday. El Capitan will be handing out the sports prize. It is yet another example of how the club skipper devotes his time and energy into helping the community. In the past Glenn Murray has handed out the award and he went on to have a pretty good 18 months, let’s hope the charming Spaniard does as well. Bravo.